A look at the Slinky Dog Coaster on the track during construction of Toy Story Land at Disney’s Hollywood Studios. Disney has announced the opening date for Toy Story Land at Disney’s Hollywood Studios. The official opening day is June 30, 2018. But as usual with new theme park lands, we expect the land will have a soft opening before that day, but there’s no telling how soon that will be. This new 11-acre land will transport guests into Andy’s backyard. Guests will think they’ve been shrunk to the size of Woody and Buzz as they are surrounded by oversized toys that Andy has assembled using his vivid imagination. 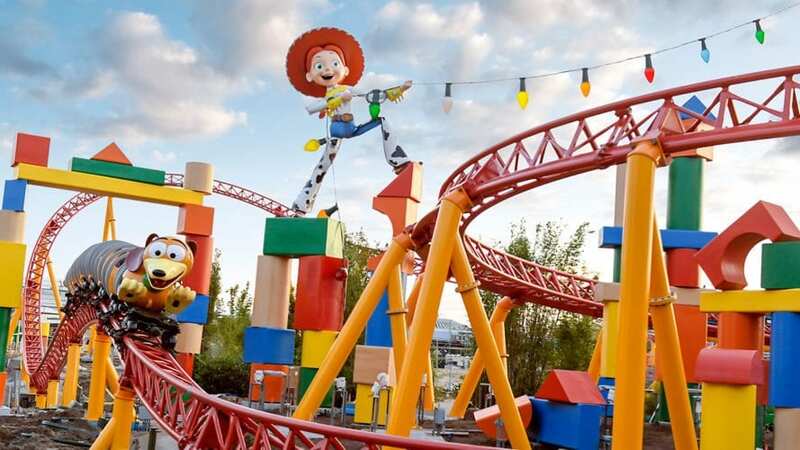 Using toys like building blocks, plastic buckets and shovels and game board pieces, Andy has designed the perfect setting for this land, which will include two new attractions for any Disney park and one expanded favorite. • Slinky Dog Coaster – This family-friendly roller coaster on the back of Slinky Dog will zip and zoom, plunge and coast as it takes guests on a fun, toy-filled adventure throughout the new land. • Alien Swirling Saucers – The famous little green aliens from the movie will take guests around for a spin in their very own flying saucers. The music, lighting and sound effects add to the flurry of action, while “The Claw” looms over. • Toy Story Mania! – Guests glide into the Toy Story Midway Games Play Set and take aim at 3D objects in a variety of fast-paced games. A new entrance to this current attraction is being built within the land. • Woody’s Lunch Box – A new quick-service window serving tasty meals and old-fashioned soda floats. Walt Disney World Resort will collaborate with Mini Babybel to bring this quick-service window to life. Here’s an overview of Toy Story Land construction from Feb. 10. There’s also a smaller Toy Story area opening April 26, 2018 at Shanghai Disneyland.